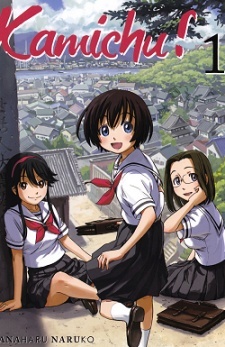 Yurie Hitotsubashi was just an average middle school student living in the city of Onomichi on Japan's inland sea. She spent her days worrying about exams and trying to get Kenji, the clueless boy she likes, to notice her. Then during lunch one day she suddenly announces to her friend Mitsue that she had become a goddess the night before. Their classmate Matsuri quickly latches on to Yurie's newfound divinity as a way to promote her family's financially struggling Shinto shrine. She hopes that in replacing Yashima-sama, their ineffective local god, with Yurie, it will make the shrine more popular. Now all Yurie has to do is figure out what she's supposed to do with her power. Impressions: good art, solid adaptation of anime which respects the spirit of it, but oddly short and missing some of the better stories. Perhaps it was not popular enough to fully cover all that the anime did? Unfortunately, overall there's not really any reason to read the manga rather than watch the anime. Masashi Kishimoto's dazzling art is one of the main reasons why Naruto has become such a huge hit worldwide. If you like his style, you'll surely enjoy the following shounen manga, full of dynamic action scenes, as well as brilliant emotional dialogue.